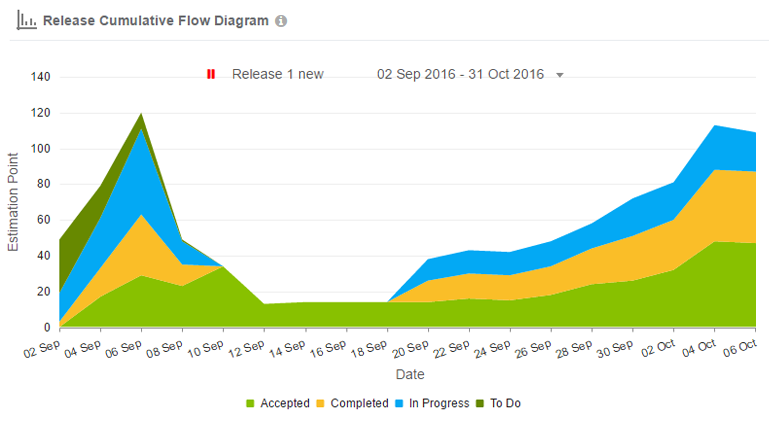 Release Cumulative Flow diagram is a great tool for tracking and forecasting projects. By the use of it you can easily check the current status: how much work has been done, what is in progress and how much is still waiting to be done in the backlog. A Cumulative Flow Diagram provides both quantitative and qualitative information about the process’s performance. X Axis - shows the last 30 days (Date). Y Axis - show the total of all the Estimation Points of all the user stories with in a sprint from release. Blue color - To Do status from all the sprints within a release. Orange color - In Progress status from all the sprints within a release. Light Green color - Completed status from all the sprints within a release. Dark Green color - Accepted status from all the sprints within a release. Based on selected team, consider only those stories which are having estimation point with it.